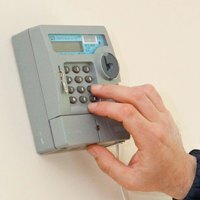 Below is our guide to reading common meters including clock dial, keypad and economy 7. If you are prompted to enter one meter reading this means you have a single rate meter with a flat rate for your electricity all day. You may use electricity to power lights, immersion heaters, electric showers and other appliances. If you are prompted to enter two or more meter readings this means you have a dual rate meter with different rates throughout the day. For example, you may have a higher electricity rate at breakfast and tea-time but a lower rate over night. You will use electricity to heat water and for storage heaters.